National Volunteer Week, April 15 to 21, 2018, is dedicated to recognizing and thanking the volunteers who lend their resources to support causes. Organizations are always looking for volunteers to lend a hand. Searching for volunteering opportunities in your community is relatively easy. Visit volunteermatch.org or volunteerhouston.org to see upcoming volunteer opportunities for your most cared for causes. 18 or under? Serve for Good, developed by local Houston high school students, lists nearly 100 organizations with volunteer opportunities for children and teenagers. Sheldon Lake Prairie Restoration on 4/17/18. A weekly volunteer opportunity, every Tuesday, that include separating and potting rescued grasses, planting mature grasses and collecting seed. Orientation for New McGovern Centennial Gardens on 4/18/18. A monthly orientation, learn about becoming a regular volunteer at McGovern Centennial Gardens. For more information, email [email protected]. Japanese Garden Volunteer Opportunity on 4/19/18. A weekly volunteer opportunity, every Thursday. For more information, email [email protected]. Stormwater Wetland Program on 4/19/18. A weekly volunteer opportunity, every Thursday. Help propagate plants in the wetland plant nursery. For more information, email [email protected]. HPARD’s Native Plant Propagation Workday on 4/19/18. The Habitat Restoration group meets every second and fourth Thursday of the month from 9 a.m. to noon at the HPARD Greenhouse. For more information, email [email protected]. Prairie Friday on 4/20/18. An opportunity to participate in stewardship work. Please visit abnc.org for more information. Jesse Jones Park Bioblitz on 4/21/18. Document and identify the diversity of plants and animals in the park. Call 281-446-8588 for reservations or information. Friends of Don Green Park hosts workdays on the third Saturday of most months, including April 21 this year. Near Meyerland. Migration Celebration on 4/21/18. Volunteers are needed for events, tours, presentations and other activities at this family nature festival. Email [email protected] for more information. Stormwater Wetland Spring Planting at Exploration Green on 4/21/18. Plant the shores of Exploration Green Nature Park’s new lake. For more information visit tcwp.tamu.edu or contact Mary Carol Edwards at [email protected]. Olivewood Cemetery Clean-up on 4/21/18. First and third Saturdays of each month, 9 a.m. to 12 p.m. Please visit descendantsofolivewood.org. Willow Waterhole 2018 MusicFEST on 4/21/18. Volunteers are needed for the sixth edition of the Willow Waterhole 2018 MusicFEST. For more information, visit mailchi.mp. Earth Day Houston on 4/22/18. CEC is coordinating volunteers to serve as recycling ambassadors for a 2-1/2 hour shift. Email [email protected] if you are interested in volunteering, and please let us know if you represent a group. CEC hopes to hire several volunteer interns this summer, with meaningful work, a mentorship program, field trips, flexible hours, and a constant supply of chocolate. If you or someone you know is interested, please send a resume to [email protected], and await a response after Earth Day. The banner above is currently the banner photo for the National Volunteer Week page on pointsoflight.org. Organized by Volunteer Houston, this workday benefited MECA Houston‘s 100-year-old school building, where CEC’s office is located. It’s a fun place. Please mark your calendars for Earth Day Houston on Sunday, April 22, 2018, from noon-6 p.m. at Discovery Green! Hosted in partnership with the Citizens’ Environmental Coalition, Discovery Green’s citywide Earth Day celebration–presented by Green Mountain Energy–is designed to inspire, educate, and encourage action. Over eighty exhibitors and a foodie farmers market with dozens of vendors. Earth Talks: Short, engaging talks from local experts about compelling environmental issues. Speakers include Houston Mayor Sylvester Turner, tropical disease expert Dr. Peter Hotez, plastic pollution youth advocates Caolin and Lila, sustainable design house Magpies & Peacocks, NASA, HARC’s Lisa Gonzalez, and more. Compost, recyclables, and trash: Volunteer recycling ambassadors will help visitors make wise disposal choices. While Earth Day Houston 2018 won’t be a zero-waste event, we are setting a baseline for future events by tracking and weighing all garbage destined for the landfill–and measuring waste being diverted for recycling and composting. Make a difference: You will be challenged to make commitments to protecting and improving our environment. And if doing good isn’t enough, we’ll have prizes. Acoustic music and pop-up activities–including live animal and plant demonstrations, story time, an electric car petting zoo, recycling superheroes, and functioning solar panels–throughout the day. Alternative transportation, including bike rides, a bike valet, and Metro passes will be available. Climate change is real, and it’s up to the will of the people to reverse its adverse effects. This is the argument that drives Disobedience, produced by the activist organization 350.org. Disobedience introduces us to inspiring groups of people who are advocating for a better way of life for their families, their communities and their planet. For a closer look, watch the trailer. The screening will be followed by a panel discussion with local activists who will talk about whether, when, and how civil disobedience relating to environmental issues is appropriate for Houston. April 18, 2018, at Rice Media Center. 6:30 p.m. conversation, networking, and a light meal; 7 p.m. screening. Free to the public, although donations are kindly appreciated. Find more information at the Facebook event. CEC’s second annual environmental trivia contest, will be a chance to join in friendly competition with other treehuggers at Saint Arnold Brewing company on Sunday afternoon, May 20, 2018. To get the competitive juices flowing, visit Instagram for our weekly Trivia Tuesday contests. Individual and team tickets are now available on Eventrbite. Throughout April, remember to give $1, $3, or $5 to EarthShare of Texas when you shop at any H-E-B or Central Market. 100% of those funds go to the 42 environmental charities-including CEC and many of our member organizations-that belong to EarthShare of Texas. Through this partnership H-E-B and its customers have donated almost $1 million to EarthShare of Texas. Help us make that $1 million mark this year. On April 9, the U.S. Environmental Protection Agency announced an agreement had with International Paper Company and McGinnes Industrial Maintenance Corporation to perform a remedial design for the San Jacinto River Waste Pits Superfund Site selected remedy. The selected cleanup action addresses the potential dangers posed by dioxin contamination at the site in east Harris County. The EPA’s cleanup plan, with support from state partners and the U.S. Army Corps of Engineers, includes installing engineering controls before excavating approximately 212,000 cubic yards of dioxin contaminated material for disposal. The estimated cost for the remedy is $115 million. EPA added the San Jacinto River Waste Pits Superfund Site to the National Priorities List of Superfund sites in 2008 after testing revealed contamination from dioxins and furans near the waste pits. For more information, see the EPA press release. Each year, H-GAC receives pass-through funding from the Texas Commission on Environmental Quality to fund solid waste grant projects throughout the 13-county region. The application period closes on April 19, 2018, at 5 p.m. For more information, visit h-gac.com or contact Erin Livingston at [email protected] or 832-681-2525. Through May 3, 2018, NOAA and its partners are conducting the Gulf of Mexico 2018 expedition, a mission on NOAA Ship Okeanos Explorer to collect critical baseline information about unknown and poorly understood deepwater areas in the Gulf of Mexico. Check the expedition pages for daily updates, mission logs, images, and videos. The Texas A&M AgriLife Extension Service is hosting three forums–in Beaumont (April 16), Rosenberg (April 17), and Victoria (April 23)– for county and local officials, staff and others involved with long-term community recovery and development to hear guest speakers from around the country who have led their communities through the long-haul of disaster recovery. In the aftermath of Harvey, many communities sense the possibility of long-term opportunities to do things differently and are looking for a game plan. For more information and to register, visit eventbrite.com. The Climate Community of Practice brings together extension, outreach and education professionals and community officials along the Gulf Coast to learn how coastal communities can adapt to sea-level rise, precipitation changes and other climate-related issues. The 2018 Climate and Resilience Community of Practice meeting will be held April 30-May 1, 2018 at the Port Aransas Civic Center. For more information and to register, visit masgc.org or contact Heather Wade at [email protected]. The 7th Annual Wyland National Mayor’s Challenge for Water Conservation is underway. Do your part this Earth Month by going to MyWaterPledge.com and make your pledge to conserve water and energy on behalf of your city. The Wyland Foundation is giving away more than $50,000 in prizes to a deserving charity and $5,000 toward home utilities. Gulf Coast Bird Observatory’s Spring Fling is an opportunity to see and celebrate the return of migratory songbirds as they arrive at stopover habitat along the Teas Gulf Coast. Spring Fling is taking place at the Quintana Neotropical Bird Sanctuary daily through May 6 from 9 a.m. – 4 p.m. daily. For more information, visit gcbo.org. On April 14, 2018, from 8:30 a.m.-noon, the Student Conservation Association joins Memorial Park Conservancy to clear storm debris from an important ravine that drains into Buffalo Bayou. Volunteers will also be improving habitat at the Hogg Bird Sanctuary, a small piece of land that borders Bayou Bend off Memorial and Westcott. Enjoy breakfast and treats as you help celebrate Earth Day! For more information and to register, visit memorialparkconservancy.org. Exploration Green Nature Park in Clear Lake City is holding wetland planting events on the following Saturdays: April 14 and 21, and May 5 and 19, from 9 a.m. to 12 p.m. Children are welcome to participate with family members. Parking is at 16203 Diana Lane, Houston 77062. For more information, visit explorationgreen.org. The Baytown Nature Center, 6213 Bayway Drive, is hosting its annual Nurture Nature Festival on April 14, 2018, from 10 a.m.-6 p.m. This free, family event introduces visitors to the reptiles, birds, fish and native plants of the Baytown area through fun activities for all interests and levels and includes exciting children’s games, informational exhibits, live animals and a variety of food. For more information, visit baytown.org. Join the International Crane Foundation on April 14, 2018 from 1-3 p.m., at the Art Institute of Houston, 4140 Southwest Freeway, to see Ciming Mei’s photographs of Siberian Cranes and Whooping Cranes, two of the 11 endangered cranes of the world. At 1:30 p.m., Mei will discuss the struggles these cranes face and how you can help save them. Whooping Crane Outreach Coordinator Corinna Holfus also will be on hand to talk about the ICF’s work. For more information, visit savingcranes.org. From April 14-22, 2018, Interfaith Power & Light is sponsoring Faith Climate Action Week, focusing on how faith communities can take action to protect our climate. This year the theme is “Charged with Faith: Leading the way to a clean energy future.” Find more information and preregister here. The U.S. Fish & Wildlife Service is hosting the Booming & Blooming Festival Attwater’s Prairie Chicken Festival at the Attwater Prairie Chicken National Widlife Reserve in Eagle Lake from April 14-15, 2018. The event includes chicken viewing tours, walking and car tours, and a children’s art display. For more information, visit fws.org. Discovery Green, downtown Houston’s eco-friendly, highly successful community park, holds 10th Birthday Celebration on April 16, 2018 from noon-6 p.m.. Celebrate 10 years of Discovery Green and the impact it has had on Houstonians. For more information, visit discoverygreen.com. Bike Houston hosts its “Bike Summit: A Celebration of Cycling” on April 16, 2018, from 5-8:30 p.m. at Saint Arnold Brewing Company, 2000 Lyons Ave. The Summit is an opportunity to honor those who are making a difference in transforming Houston into a more people- and bike-friendly place. This year the group is honoring Mayor Sylvester Turner for his leadership in passing the Houston Bike Plan. Food and beer will be provided by Saint Arnold Brewing Company, and there will be an expo of local partners and bike shops. For more information and to register, visit bikehouston.org. The Galveston Island Tourism Council and Artist Boat will co-host an Environmental Forum for state and local candidates at the Artist Boat Coastal Heritage Preserve, 13117 Settegast Road, on April 16, 2018, from 5:30-7:30 p.m. The event will also provide opportunities to meet representatives from nonprofits, state and federal agencies and learn how government and nonprofits can work together to raise funding to save 669 acres of coastal ecosystems. For more information, go to the Facebook event. The Houston Advanced Research Center (HARC) presents retired U.S. Navy Rear Admiral Jonathan White, former Oceanographer of the Navy and current CEO and President of the Consortium for Ocean Leadership, on April 17, 2018 beginning at 6 p.m. in the Brown Auditorium of the Museum of Fine Arts, Houston. White will discuss climate and ocean issues in the context of national security, energy and economic prosperity with a focus on opportunities and solutions for the future. For more information and to register, visit harcresearch.org. Anyone who loves to be outdoors and is interested in becoming a regular volunteer in McGovern Centennial Gardens should attend an upcoming orientation. Join Hermann Park Conservancy on April 18, 2018, from 9:30-10:30 a.m to learn about volunteer opportunities and the history of the Hermann Park Conservancy. Sign up at hermannpark.org. The Galveston Bay Foundation will hold its Annual Meeting on April 18, 2018, from 6:30-8:30 p.m. at the Children’s Museum of Houston, 1500 Binz St. The event will include a presentation by Dr. John Jacob, director of the Texas Community Watershed Partners program and professor and extension specialist with the Texas AgriLife Extension Service, entitled “Learning to Sing the Song of our Land: How to Live Well on a Flat Coastal Plain.” For more information and to register, visit galvbay.org. On April 19, 2018 at 10 a.m., join us as we celebrate the next phase of Sims Bayou Greenway. When complete, Sims Bayou Greenway will be about 20 miles long and will connect communities to parks and nature along the way. Sims Bayou is one of eight bayous being transformed through Bayou Greenways 2020, a city-wide project to complete a 150-mile network of parks and trails along Houston’s major bayous. For more information, visit houstonparksboard.org. “Pongo” is the genus name for the orangutan we all know and love. Pongos Helping Pongos is an art event saving animals in the wild on April 19, 2018, from 6-9 p.m. View and bid on original artwork created by orangutans, elephants, clouded leopards and more. All proceeds at this special event are donated to help save wild pongos and other animals in their natural habitats. For more information and to register, visit houstonzoo.org. The Columbia Alumni Association of Houston and the University of Houston Law Center will present Dr. Marco Tedesco of the Cryopheric Processes Laboratory at Columbia University’s Lamont-Doherty Earth Observatory in a talk entitled “Melting Ice Sheets and Sea Level Rise: Processes, Estimates and Future Projections” on April 19, 2018 beginning at 6 p.m. at the UH Law Center, 4604 Calhoun Road. The event is free but RSVP’s are encouraged at houston.alumni.columbia.edu. Join Holocaust Museum Houston for the fourth lecture of the Spring 2018 Public Lecture Series, “Intergenerational Trauma & Memory: History Carried Through Generations,” by Dr. Alex Alvarez, professor of Criminology and Criminal Justice at Northern Arizona University, on April 19, 2018, from 6:30-8 p.m. at HCM’s temporary location at 9220 Kirby Drive, Ste. 100. The talk will examine some of the risk factors for violent conflict brought by climate induced stress, especially around resources, population displacement and borders. The lecture is free and open to the public. Seating is limited, and advance registration is requested. To RSVP online, visit hmh.org. The Progressive Forum will present Dr. Katharine Hayhoe, director of the Climate Science Center at Texas Tech University, in a talk entitled “Mitigate and Adapt – Or Suffer: Planning for Climate Resilience in Houston’s Post-Harvey World” on April 19, 2018 beginning at 7:30 p.m. at Congregation El Emanuel, 1500 Sunset Blvd. For more information and to purchase tickets, visit progressiveforumhouston.org. The 16th Annual Galveston Feather Fest runs April 19-22 The event offers four days of excellent birding and nature photography workshops and adventurous field trips, topped off with delightful evening social events. It also includes opportunities to meet and mingle with some of the top naturalists in the country. The festival headquarters is on the campus of UTMB’s Osher Lifelong Learning Institute in the Island Community Center, 4700 Broadway. For more information and to register, visit galvestonfeatherfest.com. On April 20-21, from 9 a.m.-3 p.m., join Houston Zoo for a “Party for the Planet” to celebrate the Earth and its wonderful inhabitants. We will have plenty of activities, crafts, music and more to make this Earth Day memorable and teach you how to protect animals big and small. For more information, visit houstonzoo.org. The Beautify the Bucket Competition allows participants to take an active role in beautifying Galveston beaches and improving stewardship behaviors. Participants in the competition paint a blue trash barrel destined for Galveston beaches based on a theme: ocean organisms, marine debris, coastal and marine ecosystems, or Galveston recreational activities. Judging for this year’s competition will take place on April 21, 2018, from 8 a.m.-noon at the Spring Adopt-A-Beach event at Galveston’s Menard Park. For more information, visit artistboat.org. Join the Nature Heritage Society on April 21, 2018 at 8:45 a.m. for a free hike and environmental clean-up along The Hill at Sims Greenway, starting at the Bessie Swindle Community Center, 11800 Scott St. All ages and fitness levels are welcome. For more information, see the Facebook event. The Texas General Land Office is hosting the Texas Adopt-A-Beach 2018 Coastwide Spring Cleanup on April 21, 2018, from 9 a.m.-noon, at beaches throughout the Texas Gulf Coast. For more information, including a listing of participating beaches, visit glo.texas.gov. Have you ever wondered what kinds of plants and animals can be found around Jesse H. Jones Park & Nature Center? Join park staff and volunteers on April 21, 2018, from 8 a.m.-2 p.m., for a day of surveying the park to document as many plants and animals as we can in one day. The event is geared for ages 10 and up. Reservation are required by calling 281-446-8588. For more information, visit the Facebook event. 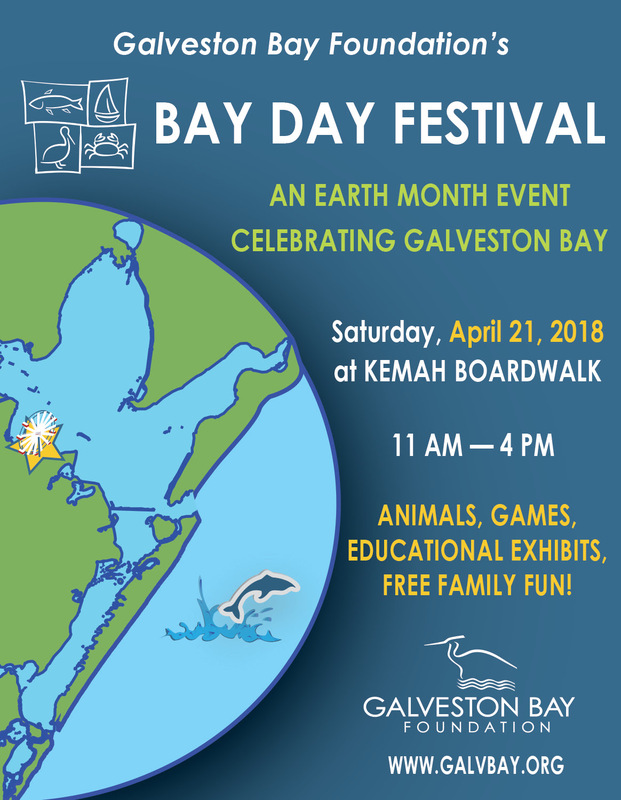 The Galveston Bay Foundation hosts Bay Day 2018, celebrating the largest bay in Texas and one of the most productive estuaries in the country, on April 21, 2018, from 11 a.m.-4 p.m., at the Kemah Boardwalk. The free event includes bay-themed arts and crafts, live animal demonstrations and touch tanks, a scavenger hunt, science and marine exhibits, live music, and more. Children and adults will have fun learning about the importance of Galveston Bay in our everyday lives at exhibitor booths including Baytown Nature Center, Houston Zoo, Sea Center Texas, Texas Parks and Wildlife Department, and more. For more information, visit galvbay.org. 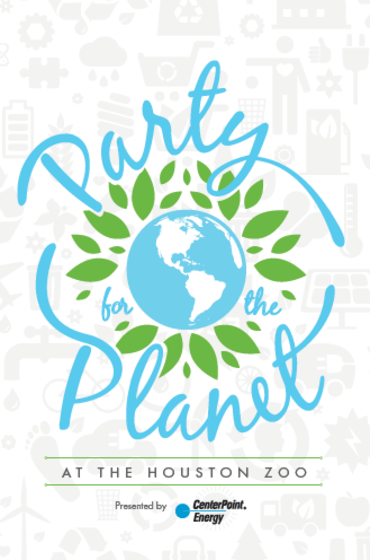 On April 28, 2018 beginning at 6 p.m., join the Armand Bayou Nature Center‘s Board of Trustees for its annual fundraising dinner and celebration, “Party for the Planet,” at the Nature Center, 8500 Bay Area Blvd. The event includes a catered dinner, live music, dancing, charitable auctions and games. For more information and to purchase tickets, please visit abnc.auctionperfect.org. The San Bernard National Wildlife Refuge in Brazoria County is hosting its annual Migration Celebration, a family nature festival, on April 21-22. The festival includes a full array of activities, tours, a photo contest, exhibitors, a marketplace, a kick-off dinner and more. For more information, visit migrationcelebration.org. The Willow Waterhole Greenway hosts its sixth annul MusicFest, featuring a diverse line-up of professional musicians and school bands, an Artists Village and more, on April 21-22. For more information, including the full roster of acts, please visit willowwaterhole.org. Drawdown EcoChallenge is a 21-day engagement program focused on carbon reduction. The Challenge takes place April 4-25, 2018, and follows actions highlighted in Drawdown, a meticulously researched book which describes solutions to global warming that already exist. Drawdown EcoChallenge is free and open to the public. Participants can join an existing team, create a new one, or join the Community team. For more information, visit drawdown.ecochallenge.org.